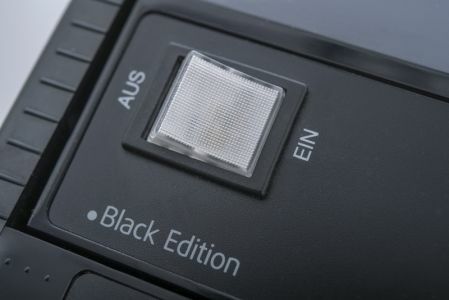 NEW in the Vacuum-Sealer "Black-Edition"
With the Lava V300 Premium "Black Edition" you know that the quality and technical ability are of the highest standards. Made in Germany and with a 2 year warranty this vacuum sealer will make light work of larger volume. 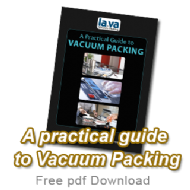 A variable pressure control valve offers the possibility to pack softer items quickly and efficiently too. There is no need to vacuum everything at full pressure with this facility. 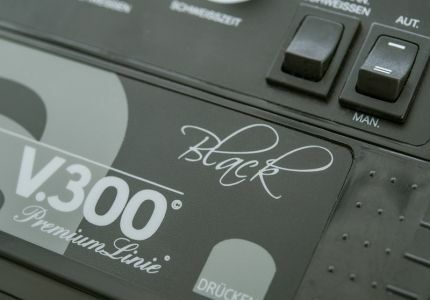 The V300 Premium also includes a double sealing bar, the 'Lava Turbo Pump' which removes 35 litres of air per minute to a pressure of -0.96 bar plus the unique 'Lava Close System'; a magnetic lid to initially keep the bag tightly in place to begin the vacuuming process. The Lava embossed bags and rolls together with the range of useful accessories, promote the extensive use of this vacuum sealer. As well as keeping produce fresh, preventing cross contamination and eliminating freezer burn why not give Sous Vide cooking a try - a precise way of delivering food under vacuum at a controlled temperature. 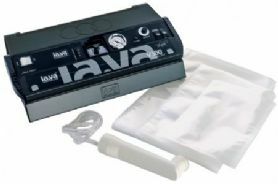 Lava offer the solution for vacuuming food and non-food items, try it for yourself.